Duplicate File Finder is the most accurate app for finding equal files on a Mac. The application allows you to quickly find all the duplicate files and folders on any type of disk; moreover, it displays similar folders. Unlike duplicate folders which contain absolutely equal content, Similar folders contain both equal and duplicate files. 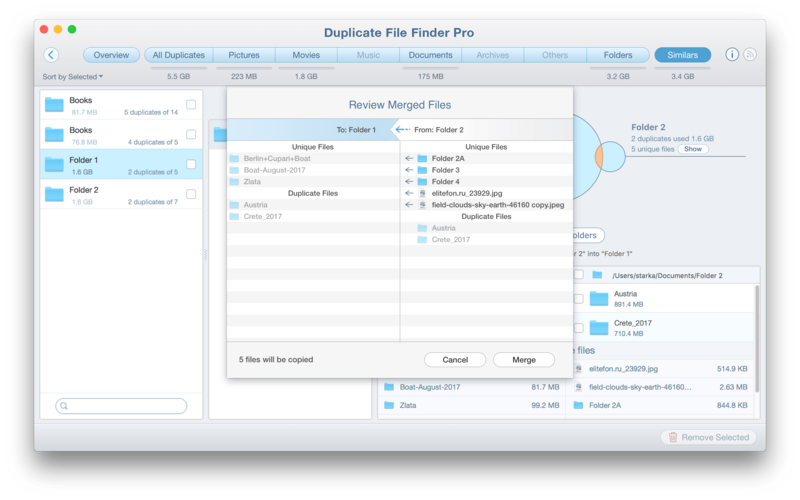 With Duplicate File Finder you can review Similar folders and merge them. In this article, we will take a closer look at this feature. Open Duplicate File Finder and scan your folders or disks. Switch to the Similars tab and click the Merge Folders button. You will see a dialog window, which displays the folders for merging. Here you can change the merge direction as well as indicate which folders’ files would be copied to another folder. Copy unique files – the unique files from one folder will be copied to another folder. As a result, you will get two absolutely duplicate folders. Move unique files – the unique files from one folder will be moved to another folder. As a result, you will get two different folders: one of them will contain a mix of duplicate and unique files; the other folder will contain only duplicate files. Remove source folder after merging – after copying/moving files from one folder to another, the source folder will be removed automatically. Merge duplicate files with different names – the duplicate files with different names will be copied/moved from one folder to another. Set Finder color tag to merged files – select the tag color and, after the folders are merged, the files will be marked with this color in the Finder. 3. Set up all the options you require and click Review & Merge. The application will display the duplicate files and unique files which are going to be moved or copied to another folder. In our case, there are 4 unique files to be copied. Review the files to be merged. To proceed and confirm the operation, click the Merge button. If you want to change the options or cancel the operation, use the Esc shortcut. In our case, we were copying the unique files, so we’ve got 2 duplicate folders which have absolutely identical content. This means that you can just select and remove one of these folders and you no more need to go through dozens of duplicate files to select each of them separately. Merging similar folders allows you to combine dozens of duplicate files and folders, making the structure pretty much easier. However, if you use the Copy unique files option while merging folders, you should understand that, in fact, you will have additional files in the destination folder. So, after merging Similars, you should rescan your drive and go to the Duplicate Folders section where you can review duplicate folders and easily remove unneeded file copies. Use the merge option to easily organize your files and don’t leave any duplicate space eaters behind. Keep your Mac clean from useless dupe items.